Asus has announced new upcoming Zenfone 3 series smartphone in Z3nvolution event at Computex 2016 in Taiwan. 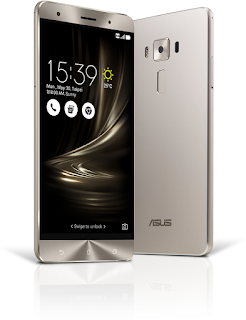 As per Asus Zenfone 3 Delux is the first ever smartphone equipped with Snapdragon 821 processor. Zenfone 3 Delux will get the flagship processor ahead of other brands making it the most advanced in its category. As far as we have received news from Asus Zneofne 3 Delux featuring a 5.7-inch Full HD (1920 by 1080) Super AMOLED display, the smartphone is also the first in the world to be free of antenna lines. Asus Zneofne 3 Delux have a 6GB RAM with UFS 2.0 256GB storage and offer a 23MP camera featuring the latest Sony IMX318 image sensor. ZenFone 3 Deluxe’s incredible 4G LTE Cat 13 and 3CA is capable of reaching 600Mbps download speed and Wi-Fi 802.11ac up to 866Mbps. The ZenFone 3 Deluxe constructed with a strong and light aluminum alloy unibody giving it a luxurious feel. ASUS is expected to introduce its new product range at Z3nvolution in India before September. As we can check on above image this might be having fingerprint sensor. Let's see what Asus has reserved us for future. Stay tuned for more thank you for reading.